Easy to use – Download right away. 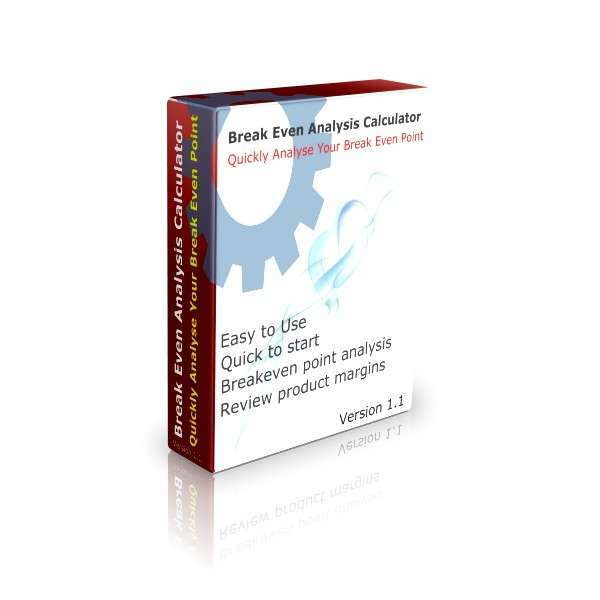 This free tool is easy set up and quick to use. Loans of up to 30 years – You can review loan periods of up to 30 years, so ideal for long-term mortgages too. Optional extra loan repayments – Once you’ve entered your loan data, easily play with ‘Over-Payment’ options. Quickly see how much interest is saved – You’ll be able to instantly see how much interest is saved from the Extra payments made on the loan. Loan term shortened – Quickly see how many months you’ll shorten the loan term by. Flexible optional extra payments too – This is a simple feature, which allows variable month by month extra payments on the loan. Quick report – Quickly print your loan scenarios on the built-in report. This free tool is a loan repayment calculator designed in Excel with the option of extra payments. The Loan Calculator With Extra Payments is for users to be able to see how a loan is affected by Over-Paying their loan. It’s amazing how much time can be shortened off a loan by making extra payments, plus the all-important interest saving. In this free loan calculator tool, we suggest you enter the details you receive from your lender first. Once you have agreed the numbers to the original loan agreement, only then begin to enter the Extra Over Payments. You will be able to see how much interest can be saved over the loan term by Over-Paying your loan. The loan calculator will also show the reduction in term in months, as a result of the over payments. The calculator will handle loans of up to 30 years in length. This will be ideal for you to look at your mortgage loan and see how you could shave off months, if not years, of repayments. This will consequently save you interest over the loan term. Entering information into the Loan Calculator is both quick and easy. This is done by using the green cells, as shown in Figure 1. All the other cells are locked and cannot be altered. In Figure 1. The first green cell is your country’s’ ‘Currency’ symbol. This is defaulted to the UK £ sign. Simply change this by selecting the cell and typing over the existing £. Alternatively, if you work in Pound Sterling, leave as is. This will then appear on the report and in front of all the loan numbers on your calculator. The second green cell is the ‘Loan Amount’. In Figure 1 you’ll see that we’ve entered £7,500 as the loan amount. It’s easy to simply enter the amount of your loan in this cell. It will be important to enter the full amount of the loan to be repaid, and in your own currency. Next is the ‘Annual Interest Rate’. This is where you’ll enter the interest rate chargeable on the loan. In Figure 1 this has been entered as 5%. This rate is not the APR (Annual Percentage Rate), but the actual interest rate on the loan. If you’re not sure what this rate is, ask the lender for the Annual Interest Rate of the loan. Then you need to enter the ‘Loan Period in Years’. This is the length of the loan, or also known as the loan term. In our example in Figure 1 this is 2 years, but if your loan was over 60 months or 5 years, you would enter a 5 in this cell, and so on. The following green cell is the commencement date of the loan. This is where you will enter the date when the first payment is due, which in Figure 1 is 1 April 2017. Finally, enter the ‘Optional Extra Payments‘, or the ‘Over-Payment’ amount. The Optional Extra Payment is the amount you are looking to pay extra on the loan per month. This is the amount over and above the original repayment amount for the loan, as given to you by the lender. The amount you enter here will be added to each of the payments for every month of the loan term. In our example in Figure 1, this is £50. Once set, you will now be able to experiment with what happens with differing ‘Over-Payment’ amounts. Work out what additional repayments you might be able to afford to repay every month. See how this will affect both the loan term and the overall interest you pay on the loan term. Just below where you enter your loan information is a summary of the loan. This summary includes the ‘Scheduled Monthly Repayments’. This is what the monthly repayment amount of the loan would be, without the Optional Extra Amounts. So you will need to make sure this figure agrees with what your lender is saying the repayments are, before you begin to play with the ‘Extra Payments’. Next you’ll see in Figure 1 above the number of ‘Scheduled Payments’, which ties in with the original loan term of two years, i.e. 24 months. Below this, and based upon additional payments of £50 per month, the loan term is reduced to 21 months. 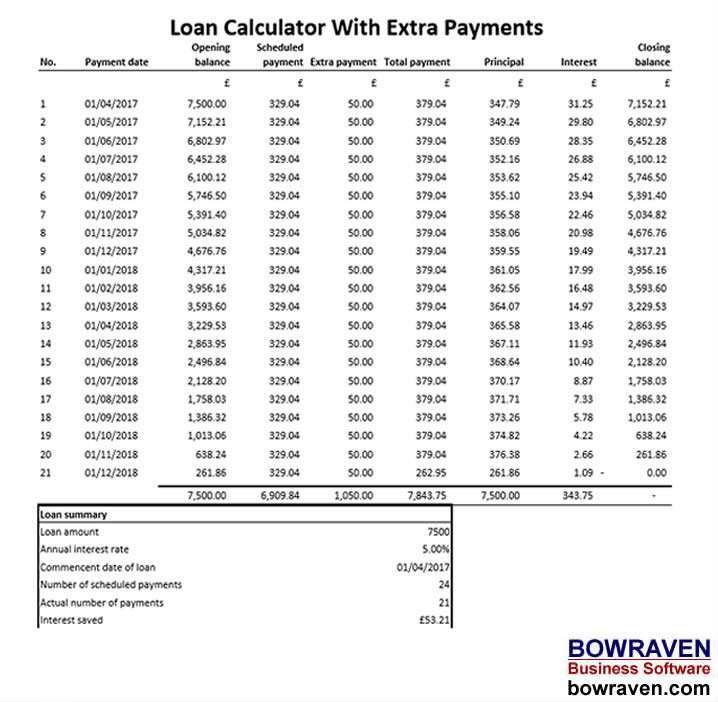 Below this is the total of loan repayments, which includes the extra payments. This is followed by the amount the interest would have been, where no extra payments are made. The next number is what the interest charge would be if you pay the extra payments (which in Figure 1 this is £50 extra per month), followed by the interest saving. So to summarise in this example in Figure 1 – the original term was 24 months with total interest of £396.96. But with monthly extra payments of £50, the term reduces to 21 months with a saving of £53.21 in interest. There is also the option of entering ‘Variable Extra Payments’. If you want to vary the ‘Over-Payment amount, you can use these individual cells by each of the monthly payment periods. You can use the two Extra Payment options together. So for example, you could enter £50 in the first cell. This is the extra amount paid for every month of the loan. Then in the Variable amount, you could look at topping this up at certain times during the length of the loan. This would be useful where you receive annual bonuses. Use this feature if you want to use some of this bonus to pay the loan down. With the Loan Repayment Calculator, you can print your loan report. We’ve included a simple way of hiding unnecessary blank cells, as the calculator is set up for loans of up to 30 years. If you have a loan which is less than this, you’ll have additional lines that are blank. So to hide the blank cells, there is a built in Macro. Hold down the Ctrl Key and Shift Key at the same time, and then press the ‘N’ key on your key board. To reverse this action, press the Ctrl Key and Shift Key together and press the ‘S’ key. This will show all the rows once more….quick and easy. 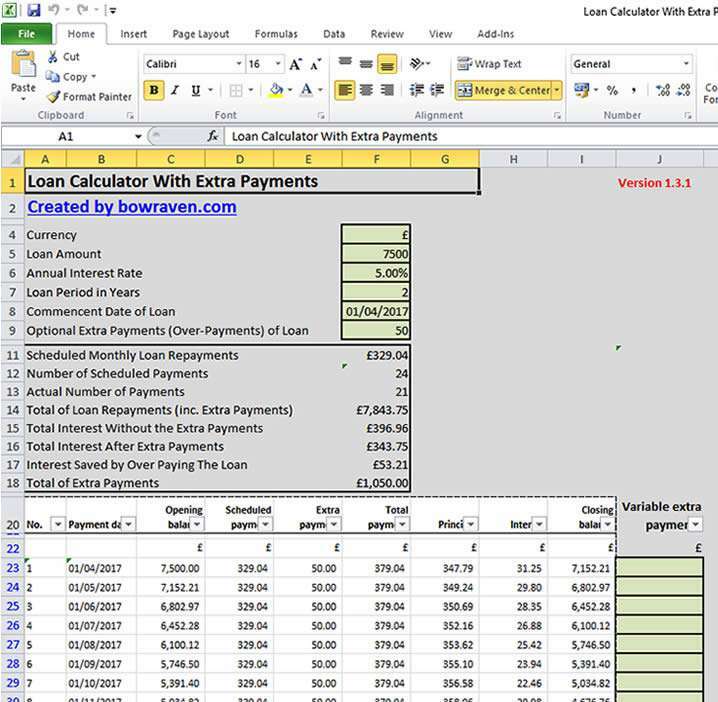 Requirements for the Loan Repayment Calculator Excel Extra Payments to work is Microsoft Excel. This is an Excel based template and designed for ease of use. So there’s no requirement to have an in-depth knowledge of the workings of Excel to use this free tool. Free support is also available too at out support forum.